It has been ruled out the possibility of launch a medium format camera. At least for now. And is that the spokespersons of the company have ensured that they have the necessary technology and components and that, if they decide to bet on this market, they could produce a medium format camera. Sony 9, A9, Medium format information leaked today. And according to the tipster the upcoming Sony Fullframe cameras will have the advance core specification and 400point based AF system, but keep in mind that what we are discussing here is not coming from a trusted source so take it with a grain of salt. Starting from medium format – The upcoming Sony medium format camera rumored to feature 50 MP medium format sensor (sensor codename MX 1621). The sensor is expected to be same as we have seen in the hasselblad X1D medium format mirrorless camera. The Sony A9 camera is rumored to have a 24 megapixel newly developed FF sensor with 400 AF points that will cover the entire display screen of the camera and will help you to track the fastest moving subject in no time. The camera also features burst modes of 14 FPS that is more than enough for a professional user. The ISO sensitivity of the camera is also very high that ranges between 50 to 204800. 1) With SLT they have more option to implement new technology inside due the presence of more space. 3) Sony will going to implement a non-bayer sensor in future, but they are in development stage now. 4) Sony is working on Light Field camera and expected to arrive soon. 5) Hybrid shutters with more range are also coming. 6) According to Sony, the DSLR sales are down due to lack o innovation, sales of mirrorless are up due to the advance technology inside it, not due to the size difference. 7) Both APS-C and Full Frame sensor cameras have a future. Wild life photographers prefer APS-C while landscape photographers prefer FF. 8) They say, It might not be so important to add 5 axis on the A7r yet. 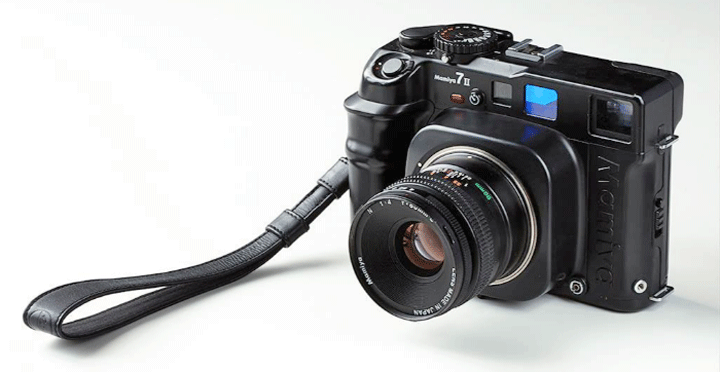 It means no 5-axis coming to A7R II. Sony Medium Format Leaked Specification - Fake OR Real? Finally the first set Specification of Sony upcoming Medium format camera surfaced over the web today, but it’s hard to believe that the specification is true.. 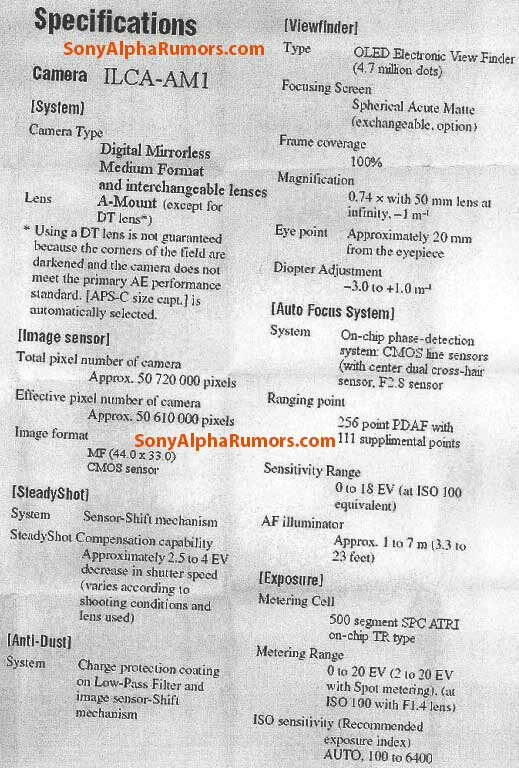 Since the leaked document is showing a newly developed medium format sensor with active phase AF pixels inside it (not same as of recently announced Sony Medium Format sensor) and the next wired thing is it’s limited ISO range of 100-6400… on the other hand the Sony FF sensor based Sony A7 camera features a ISO range of 100-25600 and the recently announced Pentax 645Z camera (that uses Sony Sensor) features ISO range of 100 to 204800.
stay with us (FACEBOOK | TWITTER | GOOGLE+) and we will update you soon as we get any new information / see more Sony Alpha Rumor. Latest rumors suggest that Sony in collaboration with Zeiss and Mamiya are preparing to announce new medium format on 2015, no detailed specification available yet, as we know that Sony is producing high quality CMOS sensors used in the latest cameras like PhaseOne and Hasselblad, so there will be no problem for Sony to develop a medium format camera. we will update you soon as we get any new information. More details about Sony to be announced Medium format camera are coming, the MF camera will feature same body design as RX series camera with a fixed Carl Zeiss lens as we have already seen in Sony RX1 and Sony RX1 R series compact mirrorless camera, the camera will be very portable (perfect for professional travel photographers) and will also have very competitive price tag. stay with us (FACEBOOK | TWITTER | GOOGLE+) If you have time –>see more Sony Rumor.